From the south: Hwy 35 north into the downtown business district in Osceola. Mill Pond Park is on the east side of the street. Turn right onto First Avenue. 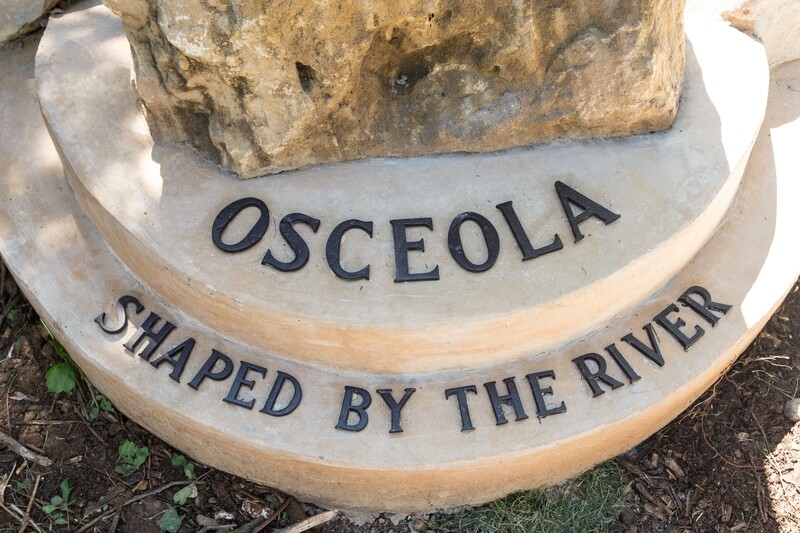 The bench overlooks the Osceola Creek, on the park’s main path. Amy Klein’s students were baffled at first by her question. The bench in Osceola’s Mill Pond Park celebrates the town’s history, community, and its identity as a St. Croix River town. To answer this question, the students, Klein, and artist David Markson set out first to understand the origins of the St. Croix River watershed, what Osceola was like before it was Osceola, and how it has all changed. “Part research, part adventure, the group trekked all over the region to find out about the land before the village existed,” Klein says. 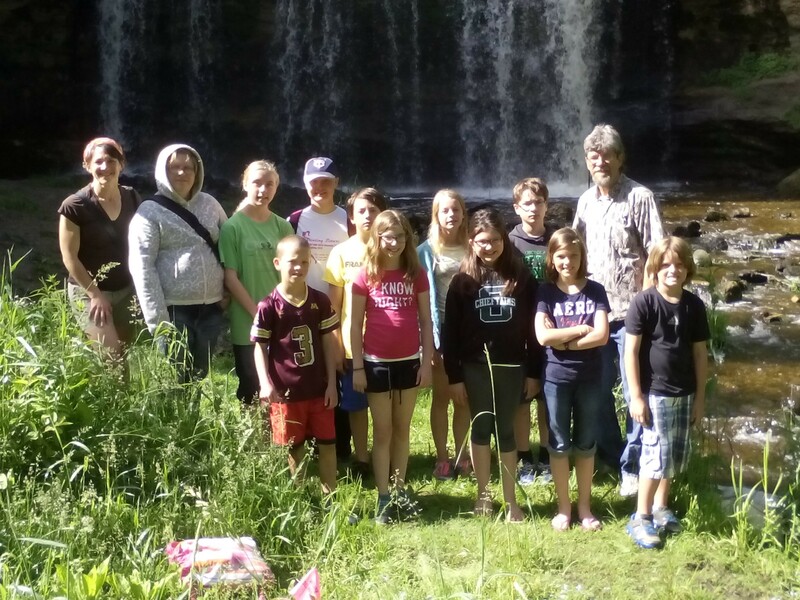 The students paddled the Saint Croix National Scenic Riverway, hiked around Standing Cedars Community Land Conservancy, learned about past industries from the Osceola Historical Society, toured Bending Branches paddle factory as an example of modern industry, and worked with artists at Franconia Sculpture Park. “They met face-to-face with National Park rangers, citizens concerned about the preservation of natural habitats, the village administrator, local businessmen, and volunteer historians. At the sculpture park, they were profoundly impacted by the power of imagination. Canoeing the St. Croix, they felt the peace and wonder of the very waterway that inspired the community of Osceola,” Klein says. The canoe trip was a highlight of the summer. The kids were challenged to cooperate and support each other. One student was very nervous, but they all pulled together to help her. “When we got out there, we discovered we could go back in time to experience some of the same things the first people who lived here experienced,” Klein says. As the group gathered ideas, they formed a sense of how people had worked together to build the town, protect the river, and shape the future. The river drew people together, where they built mills and developed the community. The students decided “Togetherness” connected all these ideas, and would serve as the theme for their bench. 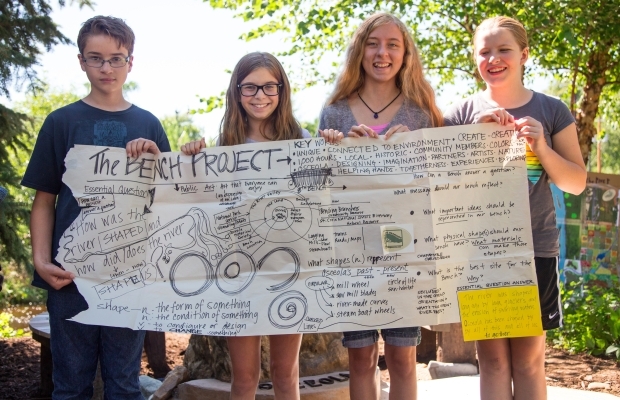 Once they had gathered ideas and experiences, the students, Klein, and Markson started designing and building the bench. 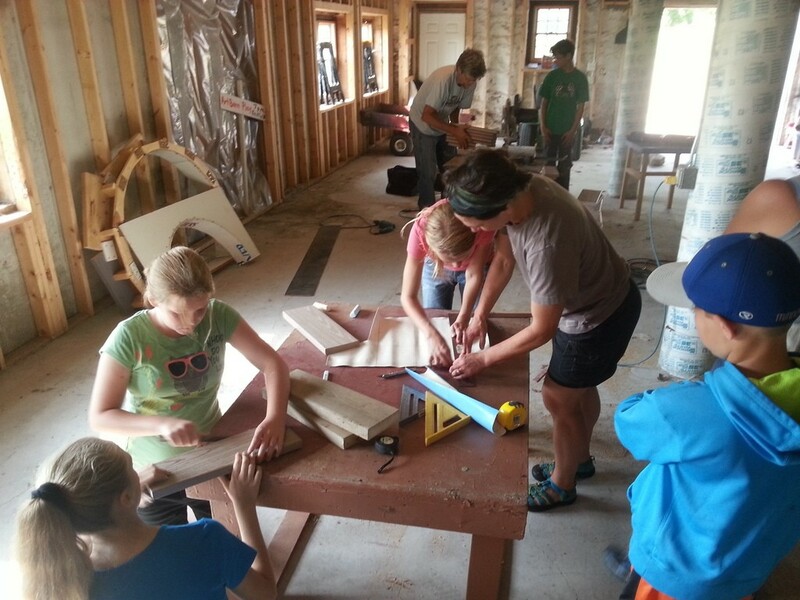 The group set up shop at the St. Croix ArtBarn, figuring out the important components, the local materials they could use, and how to make their vision become a bench. 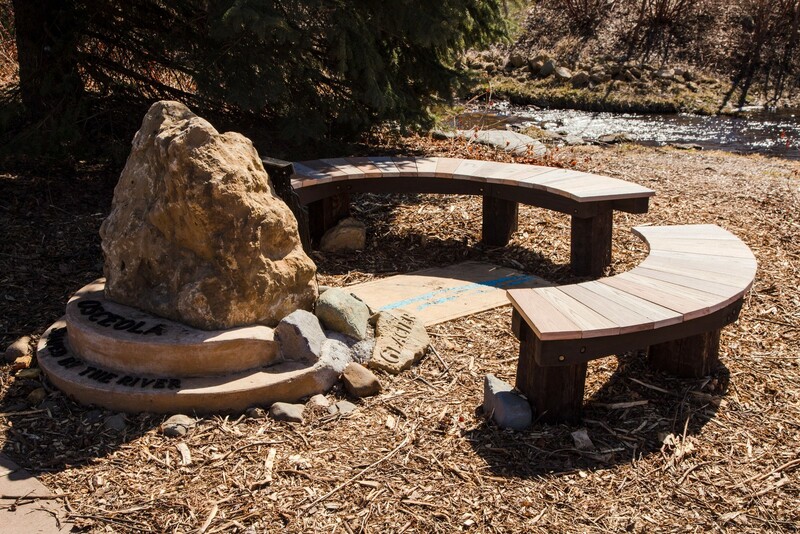 The bench would be a sculptural representation of the village’s landmark Cascade Falls, with a birds-eye view of the nearby river etched in sandstone. They started with a scale model, refined their design, and then started cutting, hammering, and sculpting. The circle seemed like the only appropriate shape. It emphasized the “Togetherness” theme, referenced important historical images like logs, saw blades, and paddleboat wheels, and let visitors look in any direction, toward the water, or to enjoy Music and Movies in the Park on summer nights. The circular design also ended up giving the kids a chance to practice some math. When it came time to cut the slats that would create the bench surface, they had to calculate how to cut the wood into the right-sized pieces of the “pie” that would form the circle. It was a good lesson in geometry, and that things aren’t always as simple as they appear. 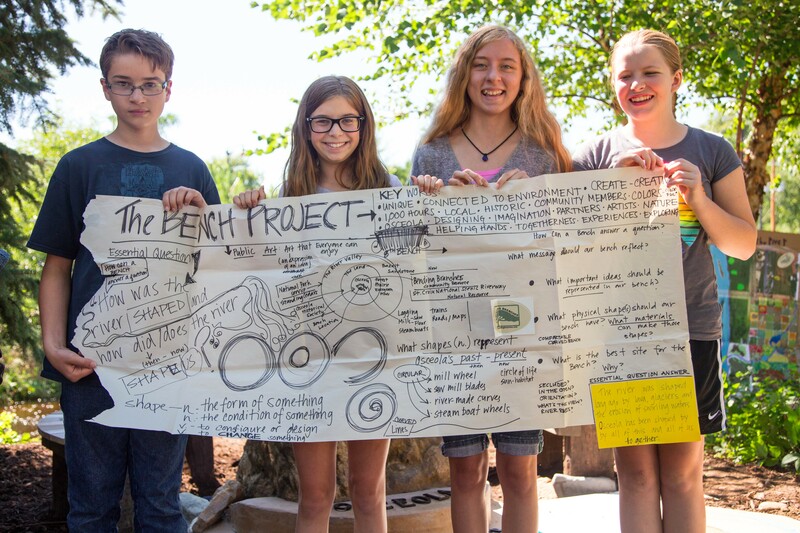 “My favorite piece of the Bench Project was collaborating and working together on a bench that will create history and bring people together–for Osceola’s history, nature and spirit,” one student artist wrote. Native materials such as basalt, sandstone and items that reflect industry such as railroad ties, steel rods, and even a wooden paddle donated by Bending Branches were incorporated into the design. They started with a pile of scrap lumber, “just like they had a pile of ideas,” said artist Markson. Meaningful words chosen by students were sandblasted into stones: history, ecosystem, 1842, mills, fishing, shaped by the river, Osceola, and of course, togetherness. Klein had also led the creation of the St. Croix Falls Art Bench, which was completed in 2006. Both project were very different, she said, but similar in one important way: the students’ creativity and energy brings their vision to life. “The biggest connection is the kids never fail,” she said. The group considered several sites to place the bench, working with the village. They wanted somewhere that felt part of nature, where it was quiet and visitors could listen to natural sounds, but also somewhere visible that it would be seen and used. They ultimately identified a spot perched over the pond. “Togetherness” was unveiled on a sunny day in early September, during Osceola’s “Wheels & Wings” and community fair weekend. It is clearly woven into the village’s tapestry of history, nature, and community. Designed by twelve third- through eighth-grade Osceola students with teacher Amy Klein and artist David Markson. In partnership with Franconia Sculpture Park, Osceola Historical Society, Osceola Public Library, Osceola School District, St. Croix ArtBarn, St. Croix National Scenic Riverway, Standing Cedars Community Land Conservancy, St. Croix Valley Foundation, The Phipps Center for the Arts, and Village of Osceola. With a grant from the National Endowment for the Arts and support from Bending Branches, Pauly Cudd, the Minnesota Transportation Museum, and Steve Mueller and the helpful employees of J & S General Contracting.